A students' shared study, in Merion Hall, a Bryn Mawr College dormitory, containing two desks, multiple chairs, and a tea table visible. There is also a window seat and doors on either side which presumably lead to bedrooms. 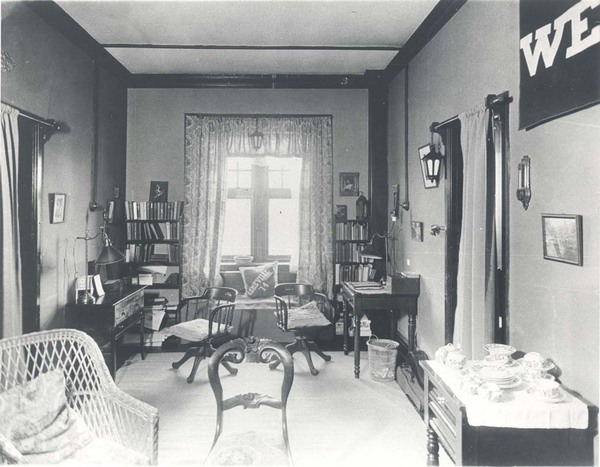 “Merion Hall Interior,” The Albert M. Greenfield Digital Center for the History of Women's Education, accessed April 18, 2019, http://greenfield.brynmawr.edu/items/show/464.